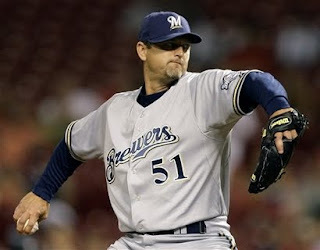 Yesterday, foxsports.com reported that a number of Brewers players were placed on waivers. The players on that list include Centerfielder Mike Cameron, Infielder Craig Counsell, Closer Trevor Hoffman, Infielder Felipe Lopez and Catcher Jason Kendall. Basically, every veteran player on the roster. Waiver claims will be made on a number of these players, and the front office of the Milwaukee Brewers will have to make some honest and realistic decisions about the future of this group. So what can we reasonably expect the Crew to do with their veterans? pop in his bat. That said, he'll be 37 before the start of next year and the Brewers will not offer him arbitration because he'll receive a raise from the $10 million he made in 2009. Also, his strikeouts with runners on-base have been increasingly frustrating. Craig Counsell: Unless Counsell asks to be traded (he won't) I don't expect to see him going anywhere. The main reason being, if he wants to play again next year the Brewers will almost certainly be interested in bringing him back. The team isn't going to be interested in trading anyone that they would like to bring back next year. (and it sounds like he will) will almost certainly have an interest in returning to the Brewers, and the Crew will have an interest in bringing him back. And if another team signs him, he'll likely be a type-A free agent, which means two extra draft picks. 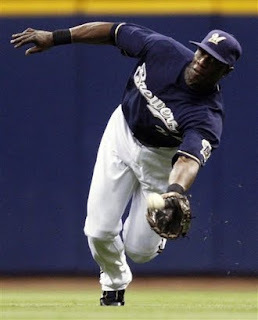 Felipe Lopez: Lopez has been a hitting machine since coming over to Milwaukee in a July trade. He's a free agent at the end of the year, so why wouldn't the team move him again? They won't, for starters, the Crew will have to seriously consider trading Prince Fielder this offense as his value will never be higher. Also, Rickie Weeks is still an unproven commodity. I think the prospect of bringing him back next season might hold some appeal. Doug Melvin & Co. would just as soon take the draft picks for Lopez who will likely grade out as a type-B free agent. Jason Kendall: Two months ago I would've said no way, Kendall will be back next year. Now, I'm not so sure. Realistically I expect that the Brewers will hold onto Kendall for the duration and re-sign him next year as a bridge to prospect Jon Lucroy. But the more and more Mike Rivera plays down the stretch the more you have to question that. Really though, what is Jason Kendall worth in the way of prospects? It's hard to quantify his value to a team which means you may not get a worthwhile return in any trade. The thing about placing a player on waivers is... they don't mean much. Players are posted on waivers every year and very, very few of them actually get traded. If the Crew are serious about contending next season than it would be shocking to see Hoffman and Counsell move. Cameron and Kendall, who knows? Olymp Trade Currently in reviewing forecasts from experts around the world a common answer seems to be that the top value will settle in at around $10,000 and one expert even projected a value reaching $100,000. Female Escorts In this crisis Esther sought a special appointment with the king without saying why. He loved her so much that he told her he was prepared to do anything for her, even up to offering her half his kingdom. (7:2) That was real girl power!